There has been a sharp sudden spate of interest in Pharma Sector. NFOs dedicated exclusively to Pharma are being launched by Asset Management Schemes. 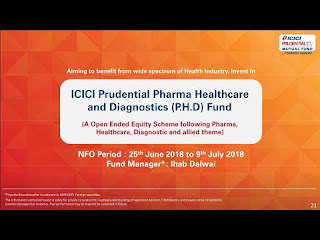 Mirae Asset and ICICI have launched their New Fund Offers in Pharma Space and Aditya Birla sunlife has applied with SEBI for their Pharma Fund. What is the reason behind this re-discovery of love towards Pharma? Our Mutual Fund Expert SRIKANTH MATRUBAI joins us in analysing the pros and cons. Pharma Sector is something which is in demand whatever be the position of Economy, whoever be in the Government. The Medical Inflation is growing at a pace MORE than normal inflation and this trend is here to stay. The cost of Medicines, treatments is only expected to keep increasing. The BEST way to participate in such a Sector is to INVEST in Pharma stocks and what’s better than a MUTUAL FUND way to do so. By investing in Pharma Fund, investors will eventually be participating in the Pharma Sector Growth. The BAD TIMES seem to be over for PHARMA. The Downside seems to have be limited. The Pricing pressure and frequent regulatory changes have all been taken in stride and the sector seems to have swallowed the Bitter Pill and seems to have emerged healtier. Every Sector goes through a Cycle and Pharma Sector seems to have turned around the Corner. Investing in a Sector Fund when it is ripe for Uptick can result in Substianal Gains. The Risk-Reward Ratio looks to be in favour of Investing in Pharma Funds at this point of time. “The challenges for pharma companies are reducing materially. Here onwards, even a small uptick in earnings will lead to substantial re-rating of stocks as valuations are rational.” Given the improvement in outlook for earnings and medium term growth prospects and valuations correction of the last three years, the sector provides a good long term opportunity. “I see value in Pharma at this point of time. “Most Indian companies have proved that they have the capability to address current challenges. For example, they have been moving up the value chain by developing speciality products. In the current scenario where valuation in certain sectors are starting to look a little stretched, these companies are reasonably cheap.” He further says “The healthcare opportunity is secular and large, and the valuations are reasonable owing to consolidation in the recent past"
“we believe that Indian pharma is out of the woods now. Overall I think pharma is an ideal 10-15 per cent growth sector. 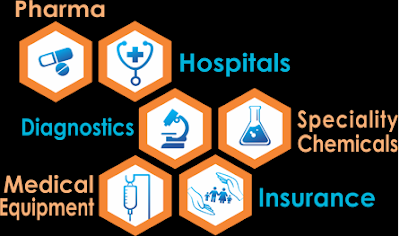 a) “As incomes go up, people tend to spend more on healthcare and diagnostics, making this a secular theme to invest for the next many years,” said Vrijesh Kasera, Fund Manager, Mirae Asset Management. "In range-bound markets such as these, a “dose” of Healthcare may be just what your portfolio needs. Consider making a judicious allocation of no more than 10% of your overall equity portfolio to it though - sectoral funds can be extremely volatile and unpredictable in the short term." 2. Pharma Sector has been underperforming for the past 2 years and the downside seems to be highly limited. 3. A Dedicated Sector Fund like the Pharma Fund has potential to deliver HUGE returns for well informed – well advised investors. 4. The Fall in Sector Funds is normally MORE than Diversified Funds as the Cushion for Diversification is limited. You need to know when to get in and when to get out of a Sector Fund and a MFD / Advisor would definitely be in a better position to suggest you the same. 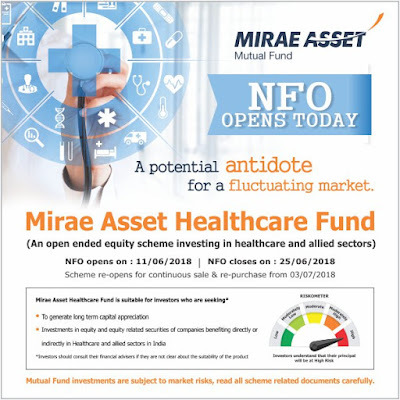 I am more inclined towards Mirae Asset Healthcare Fund NFO, due to their extremely superior performance in equity space and for their sheer consistency. 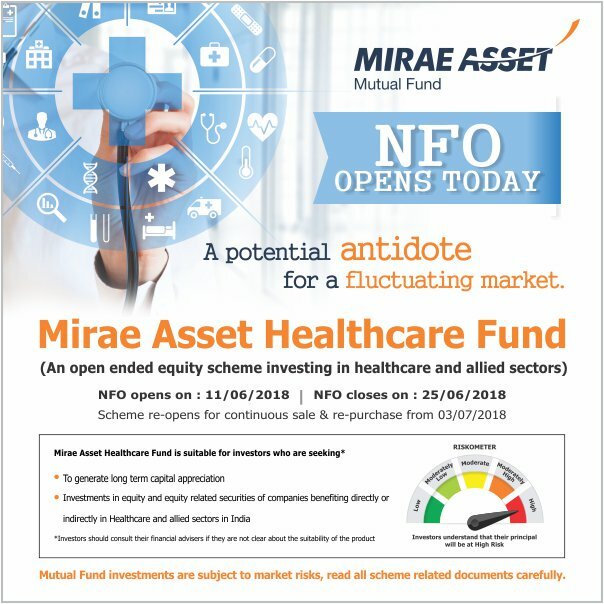 The New Fund Offer (NFO) of the scheme, Mirae Asset Healthcare Fund, will open for subscription on 11 June, and close on 25 June. The scheme will be managed by Vrijesh Kasera. If you are investing, invest with a view of at least 5 years and follow your Advisors advise. I am empanelled with Mirae Asset Mutual Fund and I distribute their funds and my views regarding Mirae Asset Funds could be biased. Do contact your advisor before investing.